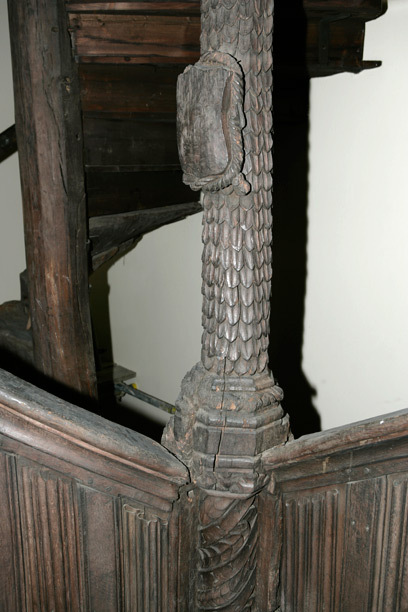 This oak staircase, dating from 1522–30, came from No. 17 Grand'Rue, the main street of the wealthy town of Morlaix, Brittany, in France. The timber-framed house was a type known as a maison à pondalez. Built from about 1450 to 1630, these houses took their name from the distinctive staircases with long landings or ponts d'aller (literally 'bridges for going'). The houses had imposing halls, spiral staircases and monumental fireplaces, deliberately recalling contemporary rural manor houses and demonstrating the wealth, status and family background of the owner. The hall was the largest room of the house, where visitors were received and business conducted. In the 16th century it was usually furnished with a trestle table and bench-chests, as well as with equipment for cooking and dining. The staircase and its landings dominated the hall. They rose to the building's full four-storey height, with the top landing underneath the roof. Facing the staircase was a monumental stone fireplace, used for heating and cooking but also the main source of light. Opposite the fireplace and set into a niche under the lowest landing of the stair, there was sometimes a stone wall fountain supplying water to the house. The interior of the maison á pondalez at 9 Grand'rue, Morlaix. © Jean-François Guével. Supplied by Musée de Morlaix. Lithograph of a view of the monumental fireplace in the hall of a house at Treguier, Brittany, by E. Cicéri after A. Guesdon, 1833. Supplied by Musée de Morlaix. Watercolour showing an additional floor inserted into 33 rue du Mur, Morlaix. The foot of the staircase descends below the floor level. Supplied by Musée de Morlaix. The internal arrangements of many maisons à pondalez have been altered since they were built. A line of damage along the panels of the first-floor landing of this staircase suggests that a wooden floor was built across the hall of No. 17 to create an additional room. During the 19th century, the roofs were also sometimes adapted and a roof lantern or dormer window inserted. This must have made the staircases – usually very dark – much lighter, and gave rise to another name for this house type, the maison à lanterne. In 1900 the staircase from No. 17 was sold to Mr J.H. Fitzhenry, an English collector, probably because it was unsafe, and he gave the staircase to the V&A in 1909. About ten maisons à pondalez survive in Morlaix, one of which may be visited: the Maison de la duchesse Anne, 33 rue du Mur, Morlaix. The panels of the landings are decorated with linen-fold pattern and the handrails are decorated with carved figures and animals. The most prominent feature of the staircase is the offset newel post that supports the landings. It is decorated with carved figures within niches, and the top of the newel post is carved in the figure of St John the Baptist. Much of the carved detail has been rubbed away over the years by people touching the woodwork as they passed along the landings. Decorative oak figure carved in the shape of a baby dragon, from a landing post of the staircase from Morlaix, Brittany, France, 1522–30. 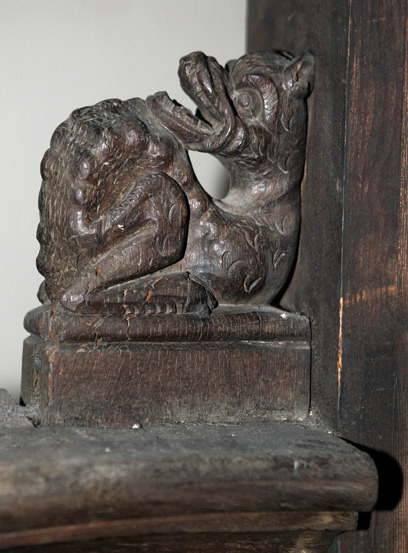 There are two more of these dragon-like figures decorating the staircase, both composite creatures with cloven-hoofed rear legs. All three were probably to ward off evil, but also to amuse. 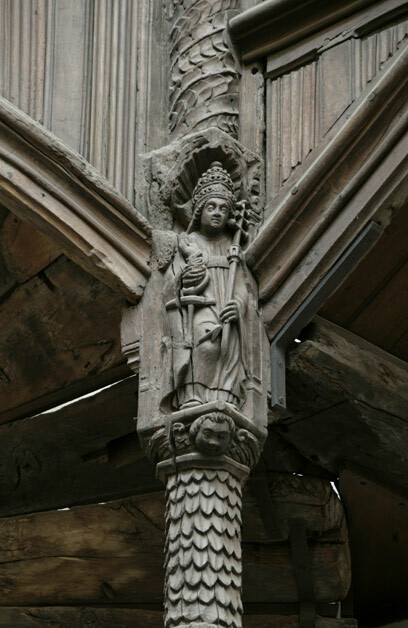 Carved oak figure of St John the Baptist, from the top of the newel post of the staircase from Morlaix, Brittany, France, 1522–30. 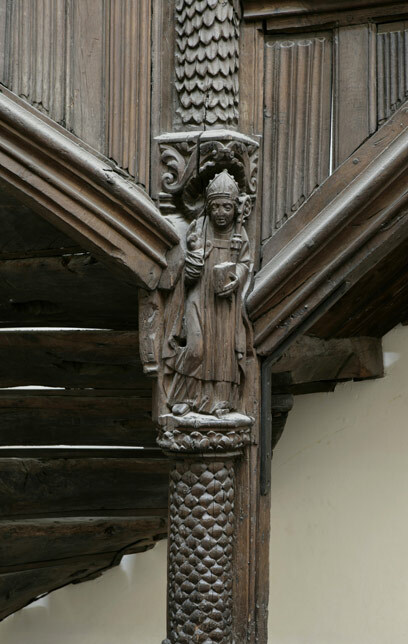 This figure, like that of St Catherine, also on the top-floor, on the landing handrail, probably represents one of the patron saints of the family. Carved oak figure of St Clement, from the newel post (second floor ) of the staircase from Morlaix, Brittany, France, about 1522–30. St Clement was pope between about AD 92–99 and was thought to be the second or third pope after St Peter. He was considered to be a martyr and is depicted carrying an anchor, because although nothing is actually known of his death, he was thought to have been executed by the emperor Trajan by being thrown into the sea weighted down by an anchor. His inclusion on the newel post was probably to demonstrate the owner's religious allegiances. 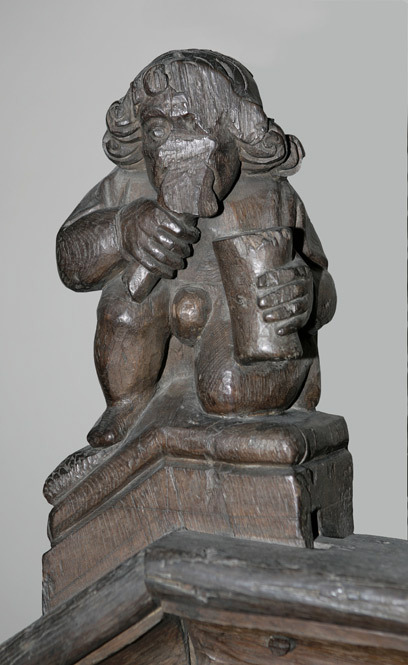 Carved oak figure in the form of a peasant eating a joint of meat and holding a cup, from the first-floor landing handrail of the staircase from Morlaix, Brittany, France, 1552–30. Carved oak shield encircled with a cord, from the newel post of the staircase from Morlaix, Brittany, France, about 1522–30. There are two blank shields carved into the newel post, that may once have borne the family's coat of arms. It has also been argued that the shields were deliberately left blank to indicate that the noble rights and privileges of the owners were suspended during their commercial activities, but that the family still retained its noble status. Carved oak figure of a bishop, from the newel post (first floor) of the staircase from Morlaix, Brittany, France, about 1522–30. This figure of a bishop cannot be identified, but as with the figure of St Clement, demonstrated the religious allegiances of the owner. 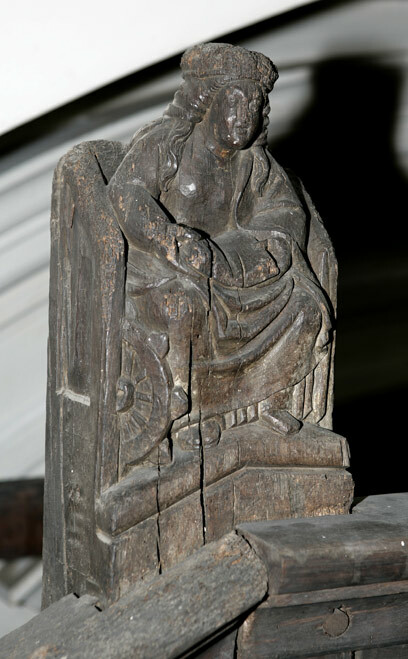 Carved oak figure of St Catherine, from the third-floor landing handrail of the staircase from Morlaix, Brittany, France, 1522–30. This figure, like that of St John, probably represents one of the patron saints of the family. The rich ornament echoed that of the house façade, where figures of saints or historical figures were placed on each storey. The V&A would like to thank Le Musée de Morlaix for permission to use images.